This week I've felt plain crummy. Kinda flu-ish with absolutely no energy. My mom dragged me to the doctor on Thursday, once we suspected it was my gall bladder. 2 years ago, when I first started having issues with my gall bladder, I had a scan that basically said my gall bladder wasn't performing ideally, but that surgery wasn't emergent. When we went to the doctor this week, they couldn't find the report for the scan, and the hospital was being super slow about sending it. Once the report came in, we headed to our general surgeon. (Yes. We have our very own designated general surgeon. 4 appendectomies in 2 years necessitates that kind of relationship :) The surgeon said that I had classic symptoms and that he was comfortable performing surgery without any extra testing. 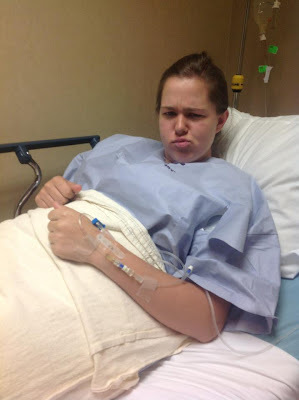 After discussing all the options, we decided extra tests weren't really going to change anything, so I decided to bite the bullet and schedule surgery for the next day, to give myself more recovery time before I move. I strongly despise anything hospital related, so I was less than pleased that immediately had to head to the hospital for pre-op labs. I have terrible veins that are hard to draw from. Typically I drink about a gallon of water to make it possible to get a vein. I was at the point where eating or drinking anything, even water, caused pain, so I hadn't really had any water that day. Plus I wasn't anticipating this blood draw, so instead of putting me through heck, the nurses decided to hold off and draw blood when I got my IV the next day. I was so grateful for that. We got to the hospital Friday morning, I got all prepped, and then we waited for ever for the surgical team to be ready. I don't know that anyone has laughed as hard as I did while waiting for surgery. We were having a good time. See how much I just love IVs? I was super calm all the way up until the anesthesiologist gave me something to "calm me down." I swear it made me more nervous and I was mentally freaking out as I got wheeled to the OR. For every other surgery I've had, I've been asleep before entering the OR. This time I was wide awake and had to climb on the surgical table. I woke up doing super well. I had an appetite right away and didn't have any nausea. The nurses said I could hang out for a few hours, but I opted to go straight home, and walked out to the car before they could even bring a wheelchair. I was worried that Day 2 would be more painful, but I'm still doing super great. So much less pain than before surgery. The surgeon said that my gall bladder was definitely chronically inflamed, but that he didn't see any problems in the surrounding areas. This news was so much better than if he had come to report that my gall bladder was perfectly healthy. I'm so glad this surgeon was willing to listen to me and take a chance on surgery without making me get thousands of dollars of testing done first. I'm extremely happy to be recovering so well, without hardly any pain. I'm super glad to have Netflix to entertain me when I wake up at 4 in the morning because I rested so much.